Having just read what she published on her blog hours ago, I could not help but share, for you to read. Quite commendable I must say. Jenny Chisom is one of Nigeria foremost blogger-coaches and the convener of the Bloggers Party amongst other blogger-initiatives she has headlined. So you see why when I read this, I was not so surprised because even though she comes off as very calm and easy going, she got quite some creativity and she shares. 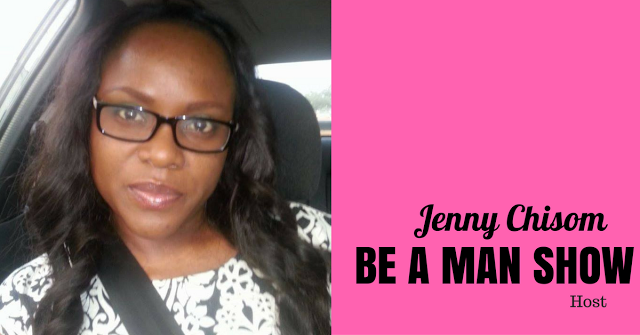 Read what she wrote about her Men stuff and do share your thoughts. When I decided that I was going to switch my blog's focus to Men's success and advocating for Men Empowerment amongst other development issues, it was like child's play. Many people told me it was an amazing idea and quite bold of me. 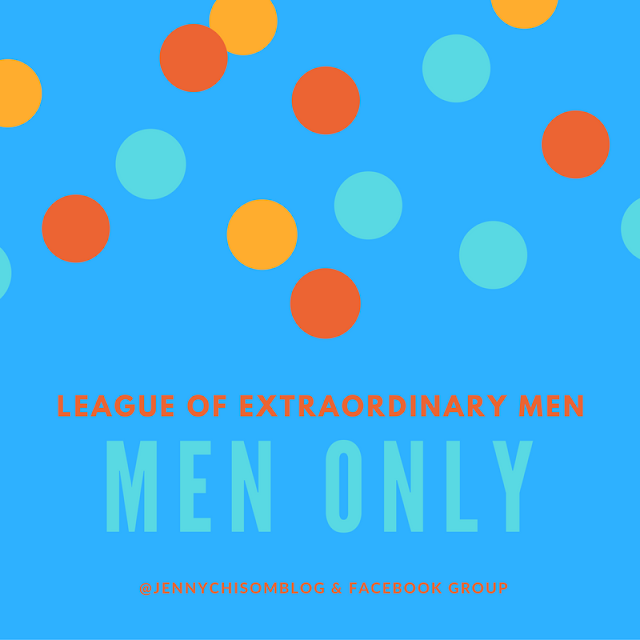 Some others were sceptical, and rightfully so and may still be but in just about nearly 4 months, the 'ministry' had birthed the "League of Extraordinary Men'' which hosts the enviable "Be a Man Show" on Facebook and then like in a non-stop flash, the need for having a live Men's summit was born and it is set to happen this Sunday, Dec. 11, 2016. Helping men succeed beyond just career and money making, which they are mostly allowed to figure out in adulthood, has been one singular area that has not been supported a lot globally. Due to certain stereotypes and societal expectation on the Male child and then the man, tags like a 'Real man" had symbolised a strong, focused, loving, rich, never-cries-or-feels-down man who embodies non-human attributes, at least I feel so. Men have been put in a box , not like women have not, but because a Man's stability is critical in the life journey and wholesome development of women and children as ''Leaders'', it will only be civil to help him with capacity, the guts and resources to do so by allowing him be real. A man is first human before he is male. With such development ideology, I am much more committed to being a mother who will (by God's grace) raise role model sons, then live my life showing women, men and girls how to treat and raise a knight- a groomed boy/man. At the end of the day, how we raise our sons will determine the kind of men that will court our queenly daughters. Raise a King and then prepare a queen for him. Do not raise a queen and allow her be battered by the insecurity of a cowardly man, who in himself needs help. I think that with the movement that this blog has risen up to carry out and your ever present support we can change the narratives around Men, and consciously support and groom better men for the sustenance of our world, made up of other men, women and children. I encourage you to join our campaign and attend the events as well as send your suggestions and by all means let us work together. For the event, it will a 3-hour heart to heart session featuring Experience-sharing, talks on finance, addiction, self-awareness, family life, courage and leadership and there will be lots of questions, answered to foster learning. 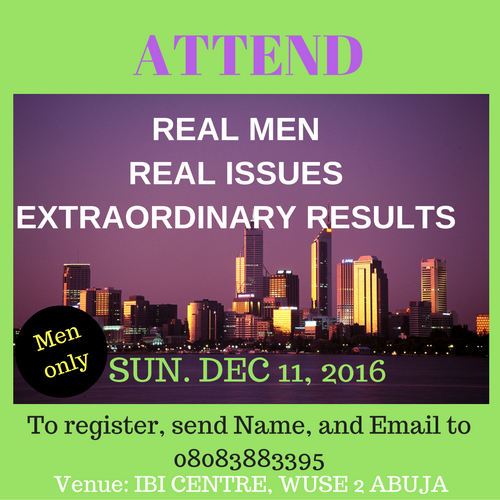 It is a summit for Men to be Real, discuss real issues and get extraordinary results. Our facilitators include Dr. Dandison Okunbor- Serial entrepreneur and pastor, Chris Chukwunyere - Relationship guru, Ifeanyi Ogbuefi- Addiction therapist, Ize Adava - Development diva, Kenneth Ogbebor- Author and entrepreneur, Oscar Ogedegbe - Construction accountant and curate amongst every extraordinary man that will attend. 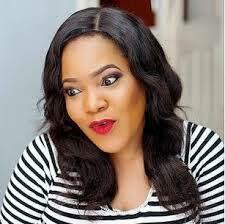 One of Nigeria’s Phenomenal TV personalities, Mary Chinda will be the official MC and we will have Adanna Enwezor, MD Photizo Life foundation as a quintessential support for counselling. 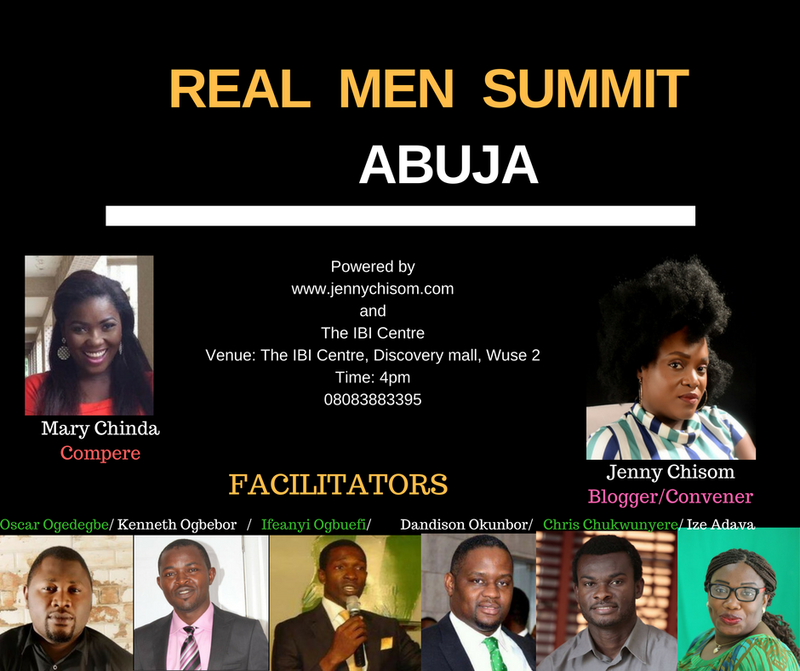 This event promises to bring healing, direction, capacity and ensure that men win in life carrying along their families and become role models in spite of the challenges of our age. They can also simply send a text message. See instructions below. All sponsorship enquiries are welcome via phone on 08038994417.